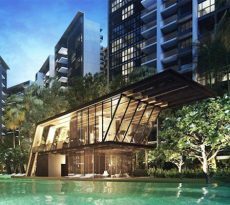 Singapore’s suburban neighborhoods are lately becoming more and more popular for investors and home buyers alike. This is hugely due to the fact that more and more families wish to raise their children in homes with lots of space, serenity, and security, preferably in an area where they can be close to nature. And because of modern advancements and infrastructure, suburban homes have become increasingly accessible, and thus, more desirable. To the delight of many, living outside of the city no longer means being cut off from its comforts – though suburban living certainly does still offer the advantage of being secluded from the hustle and the bustle. 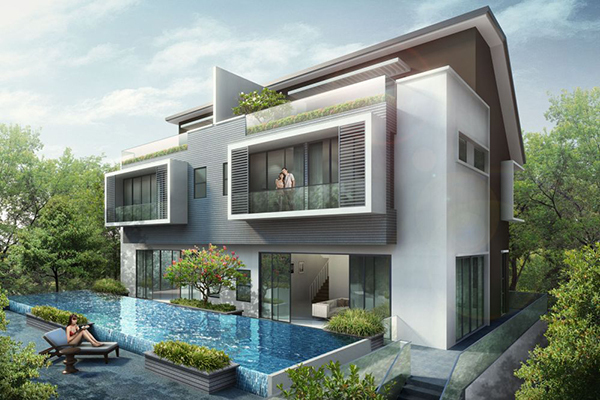 To Hougang in District 19 comes Hillsgrove: a 999-year leasehold from Sun Fong Realty. It’s a cluster house development on 5 Hillside Drive, with a dozen semi-detached homes. Each unit has five floors all in all, including a basement garage as well as an attic level. The floor area can be as expansive as 1,820 square feet, which allows enough room for a growing family. The floor-to-ceiling windows and the sliding glass doors add even more light, airiness and visual space into the interiors. The development also comes with communal amenities such as a lap pool, a children’s pool, and a sun deck. Everything is wrapped in gorgeous contempo architecture characterized by right angles and squares. To make things even better,Hillsgrove also has 24-hour security, ensuring your safety and privacy. Hilsgrove is close to Kovan Station (North-East Line). One station from there is Serangoon Interchange (North-East / Circle Lines). That there are also several bus stops and a taxi stand within a short walk. As for roads, Hougang is accessible via Upper Serangoon Rd., Tampines Rd., Upper Paya Lebar Rd., Hougang Ave. 3, Yiou Chu Kang Rd., and other routes. As for expressways, it’s easy to get to Kallang Paya Lebar Expressway, Central Expressway or the Pan ISland Expressway. Offered by the general area are myriad choices for leisure, entertainment, dining, and shopping. Naturally, there are also essentials such as supermarkets, food centres, schools, and others. Food Centres: Kovan Market and Food Centre, Sun Flower Food Centre, Hougang St. 21 Blk. 209, Chomp Chomp, Serangoon Gardens Food Market, Bedok Cooked Food. 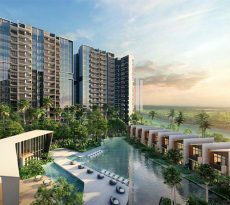 Shopping Malls: Heartland Mall, Nex, Kovan Centre, Hougang Point, Hougang Green Shopping Mall. Markets: Serangoon Market, Kovan Market and Food Centre, Hougang Village Wet Market. Supermarket: Cold Storage Heartland Mall. Schools: Zhonghua Primary School, Zhonghua Secondary School, Xinghua Primary School, Peicai Secondary, Yuying Secondary,Paya Lebar Methodist Girls’ School, CHIJ Our Lady of Good Counsel, DPS International School, Serangoon JC. Pre-schools: Hosea, Rosyth Child Care Centre, Catholic Kindergarten. Sports and Recreation: Serangoon Swimming Complex, Serangoon Stadium, Surin Ave. Neighborhood Park, Serangoon Community Park, Maplewood Park. Hillsgrove is superlative as a prospective next home. It has everything you’re looking for – comfort, space, aesthetics, good location, accessibility, exclusivity, proximity to the necessities, and more. What’s more, it’s a landed property on an indefinite 999-year lease. You may just love it more than you expect! For your next move, avail of the assistance offered by iCompareLoan mortgage broker. 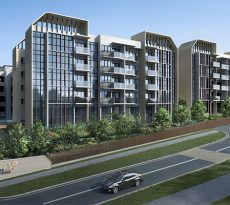 They’ll help you considerably with their know-how of real estate and their inside info on the best way to compare mortgage loan Singapore. Be sure to take advantage of this great opportunity.